WASHINGTON (AP) — The amount of heat-trapping pollution the world spewed rose again last year by 3 percent. So scientists say it's now unlikely that global warming can be limited to a couple of degrees, which is an international goal. The overwhelming majority of the increase was from China, the world's biggest carbon dioxide polluter. Of the planet's top 10 polluters, the United States and Germany were the only countries that reduced their carbon dioxide emissions. Last year, all the world's nations combined pumped nearly 38.2 billion tons of carbon dioxide into the air from the burning of fossil fuels such as coal and oil, according to new international calculations on global emissions published Sunday in the journal Nature Climate Change. That's about a billion tons more than the previous year. The total amounts to more than 2.4 million pounds (1.1 million kilograms) of carbon dioxide released into the air every second. Because emissions of the key greenhouse gas have been rising steadily and most carbon stays in the air for a century, it is not just unlikely but "rather optimistic" to think that the world can limit future temperature increases to 2 degrees Celsius (3.6 degrees Fahrenheit), said the study's lead author, Glen Peters at the Center for International Climate and Environmental Research in Oslo, Norway. Three years ago, nearly 200 nations set the 2-degree C temperature goal in a nonbinding agreement. 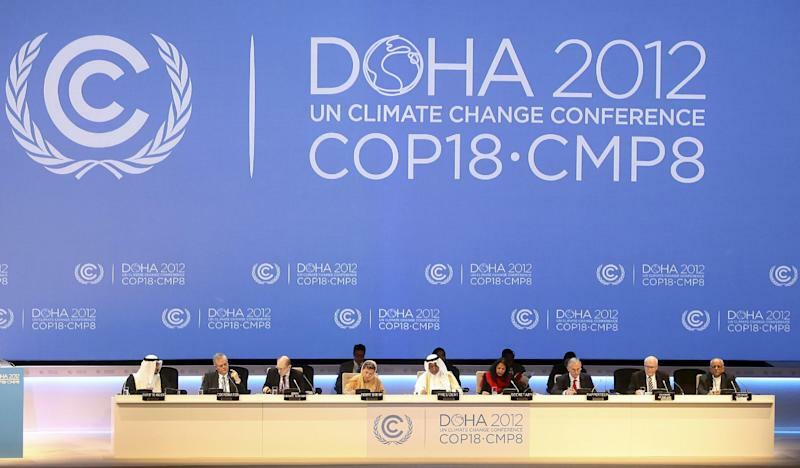 Negotiators now at a conference under way in Doha, Qatar, are trying to find ways to reach that target. The only way, Peters said, is to start reducing world emissions now and "throw everything we have at the problem." Andrew Weaver, a climate scientist at the University of Victoria in Canada who was not part of the study, said: "We are losing control of our ability to get a handle on the global warming problem." In 1997, most of the world agreed to an international treaty, known as the Kyoto Protocol, that required developed countries such as the United States to reduce greenhouse gas emissions by about 5 percent when compared with the baseline year of 1990. But countries that are still developing, including China and India, were not limited by how much carbon dioxide they expelled. The United States never ratified the treaty. The latest pollution numbers, calculated by the Global Carbon Project, a joint venture of the Energy Department and the Norwegian Research Council, show that worldwide carbon dioxide levels are 54 percent higher than the 1990 baseline. 1. China, up 10 percent to 10 billion tons. 3. India, up 7 percent to 2.5 billion tons. 4. Russia, up 3 percent to 1.8 billion tons. 5. Japan, up 0.4 percent to 1.3 billion tons. 6. Germany, down 4 percent to 0.8 billion tons. 7. Iran, up 2 percent to 0.7 billion tons. 8. South Korea, up 4 percent to 0.6 billion tons. 9. Canada, up 2 percent to 0.6 billion tons. 10. South Africa, up 2 percent to 0.6 billion tons.